Have you ever wanted to paint your rims Ferrari Red? A two-tone pattern? Maybe you want to make your rims match the body colour of your vehicle? Maybe an understated matte black? Our in-house system allows us to create any paint colour you could ever want, and we have access to the paint codes for every make and model of car ever produced, so there is essentially no colour we can’t match. If you are interested in multiple colours, we can do masking and multiple passes to get the effect you are looking for. We could do your centre caps a different colour, or we could do a red stripe on the bead of your black rims, no problem. Each complication adds a small bump up in the price, but we can easily quote you a price on any custom request. 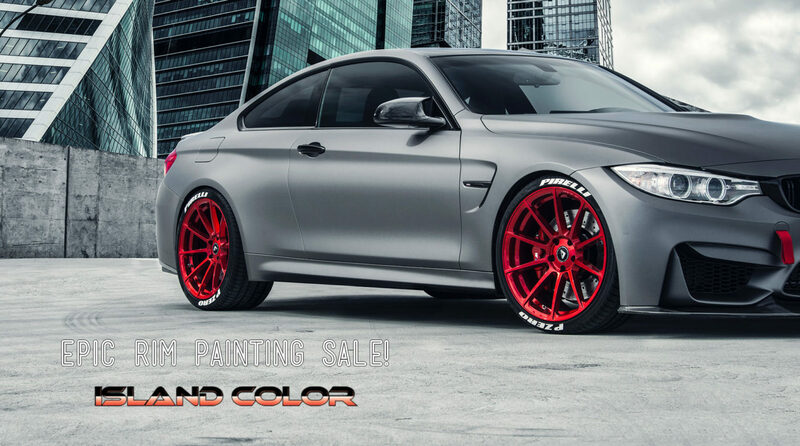 Painted rims look insanely good, you will be blown away by the result. First, we sand down all of the areas of the bumper that are scratched and scraped. The quote fee includes repairing all of the imperfections on one bumper, so we go from scratch to scratch sanding down the effected area. Once it is all sanded, we use filler to smooth our the area and bring it inline with the undamaged portions of the bumper. Once the filler dries we sand it down to make the area a perfect match to the rest of the bumper, and then we spray a layer of primer over the repaired areas. Primer creates a smooth an consistent layer for the paint to be spread over and to bind onto. After the primer is left to dry, we obtain the manufacture paint codes for your vehicle and mix a batch of custom paint just for your bumper. We are able to match any vehicle on the market, and we can match textured surfaces and pearl paint jobs as well (which require one extra coat of paint). Repair rims that are scraped, and covered in curb rash, brought back to their original state in one day. The final step involves spraying two layers of clear coat over the bumper. A vehicle’s 3d like shine when clean and polished comes from the interplay between the shiny clear coat, and the smooth paint underneath, which explains why touching up a scratch with a paint pen will never give you the results you desire. Once it is all dry it is yours to take home. The results are truly astonishing; Even when you know where to look for the repair it is completely invisible to the naked eye. When customers see this sort of work for less than the cost of their deductible they are always blown away. After 22 years on the job, we really have this type of repair down to a science. Are there ever extra charges? For repair: Nope, the cost includes one scraped up rim, no matter how scraped up it is. For paint: Yes, if you want multicolour, multistage paint, we will charge a bump up for each complication. Once you show us your rim we can give you a custom price ASAP. Can you fix damaged rims before painting? This is a job we can do in one day for a full set of rims. If you are just having a multistage paint job you should expect it to spend at least one night at the shop curing.